Clay is very fine particles of dirt which float in a stream or river and then sink to the bottom, where they press on each other and stick together. You generally find clay along the banks of a river or stream, wherever the river is pulling dirt down off the mountains or hills and dropping it in a quiet part of the river lower down. So people who live in river valleys, like early Chinese people, or the Harappans or the Egyptians or the Sumerians, generally can find a lot of clay. What is so cool about clay (besides that it is easy and cheap to get) is that it is squishy when it is wet, so you can make it any shape you like, and then it dries hard in the sun, pretty fast, as the water evaporates out. If you dry clay in the sun you can make it soft again just by throwing it in a bucket of water and waiting a week or two. 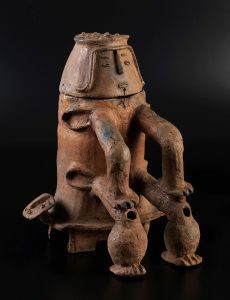 A funerary urn (for someone’s ashes) from northern Brazil, about 1000 AD – one of the objects that was in the museum that burned. 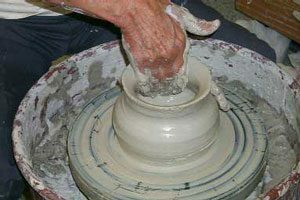 But if you put your clay pot or sculpture in a fire, or in an oven (an oven for clay is called a kiln) and bake it for a while very hot, the clay is even harder and it will not get soft again even if you put it in water for a long time. We call this process firing. 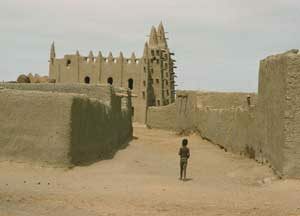 People first began to fire clay in China and Japan about 14000 BC. Probably they started by lining baskets with clay so they would hold water better, and then they started leaving off the basket and just making clay containers. They may have used these early clay pots to ferment fish, or maybe to make beer, or both. A little later, people in Iraq and Brazil and Mississippi and Peru and other places also started to make pottery. 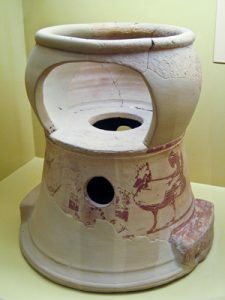 People have invented pottery many times in many different places. The most important thing that people in the ancient world did with clay was to build houses out of it by making bricks and drying them in the sun. They mixed straw with the clay to help it stick together better. We call these bricks mud-brick, or adobe (ah-DOUGH-bee), or pise (pea-SAY). Sometimes builders fired the bricks, to make them harder and more waterproof. Make your own clay toys! But potters also used fired clay to make dishes and plates and cups and cookpots. They used clay for water pipes, and blowpipes for making glass, for potty seats and high chairs and baby rattles and tobacco pipes. Builders generally fired their roof tiles, which had to be more waterproof than the walls. People used clay for statues too. 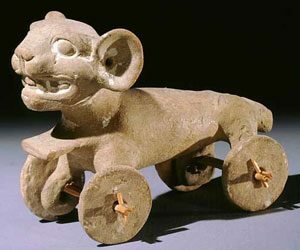 The Etruscans and people from China and West Africa in particular made great clay statues. And finally, kids made marbles, and little dolls, and toy animals out of clay. Many things that today we make out of plastic, people in the ancient world made out of clay. Cite this page: Carr, K.E. History of clay – History of Art. Quatr.us Study Guides, May 25, 2017. Web. April 19, 2019.